This recipe is everything you want in a tofu dish - it's quick and easy, really healthy, crispy on the outside and tender in the middle, and it has a delicious subtle sesame flavour that develops a nutty aroma when baked. And it's so nice have a tofu recipe that goes truly crispy just in the oven - no deep fryer necessary! 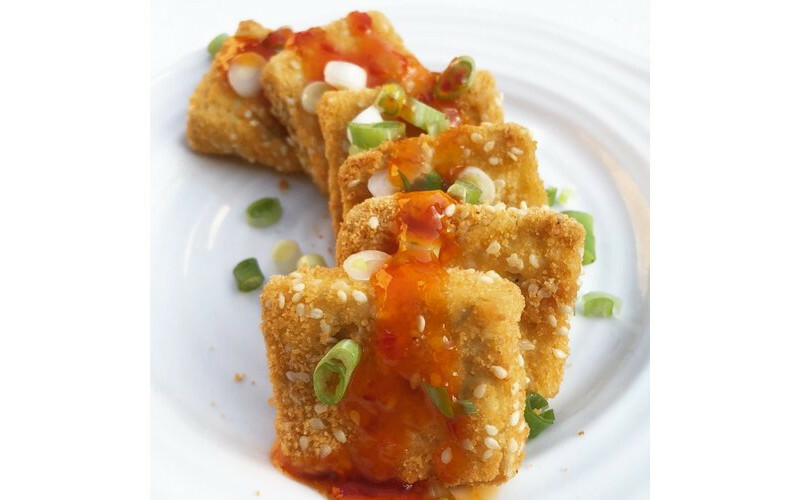 This crispy tofu is delicious eaten as it is, or goes well with your favourite dipping sauce - sweet chilli, teriyaki, peanut, or even barbecue sauces all taste great with it. It's perfect as a high-protein vegan snack or starter, but also can take centre stage served with stir fried veggies or to top a hearty salad. And this tofu dish alone provides over half of both your daily protein and iron requirements! This recipe is taken from MeatFreeFitness.co.uk by TJ Waterfall – providing delicious, quick, easy, and healthy vegan recipes, nutrition guides, and fitness tips – debunking the myths surrounding getting fit on a vegan diet using science-based evidence. To prepare your tofu, first remove it from the packaging and shake off excess liquid. No need to wrap in kitchen towels as some recipes advise - I find gently squeezing the tofu between my hands over the sink to be the best way and only takes about 30 seconds! Just be careful not to squeeze too hard and break or crumble the tofu. Now slice the tofu into small squares, rectangles or triangles. Prepare your coating mixture by making three dipping bowls. In the first, add the cornflour. In the second, the soy milk, and in the third, mix the breadcrumbs, sesame seeds, nutritional yeast, onion powder, and garlic powder. Take a tofu piece, toss to coat in the flour, then dip in the soy milk, then press into the breadcrumb mixture to coat generously on all sides and place on the baking tray. Repeat for all the tofu pieces. Now you can spritz lightly with the olive oil spray (this is optional but will help the coating to brown). Pop the tray into the oven for approx. 20 minutes until the coating is crisp and golden brown. Garnish with spring onions and enjoy on their own or with your favourite dipping sauce!